Dental implants offer the most natural approach to teeth replacement. Dentures and bridges are no longer considered an acceptable treatment for replacing failing or missing teeth. The following cases illustrate how multiple missing teeth can be replaced with dental implants. 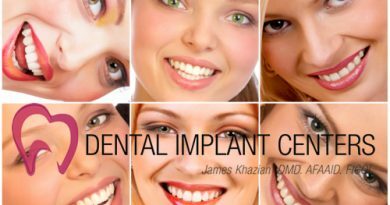 Call Dental Implant centers at 619-497-1700 to arrange a complimentary consultation with Dr. Khazian and explore your options to have a healthy, beautiful smile. This case demonstrates replacement of 2 missing upper front teeth with dental implants. These teeth had root infection and severe discoloration. The root structures were not repairable and teeth had to be removed. Note the gum recession above the tooth on the right side. Teeth were removed and 2 dental implants were surgically placed. Extreme care had to be taken to, not only preserve the gum architecture, but also repair the recession above the tooth on the right side. Final porcelain teeth are in place and attached to 2 dental implants. Note the natural look of these 2 teeth. They are indistinguishable from other natural teeth. Note also that the pre-operative gum recession which has been completely repaired. These 2 porcelain teeth had to be custom colored to perfectly blend in with adjacent teeth. These 2 implant teeth look, function, and feel like natural teeth, and this young female patient can smile with confidence. This case demonstrates replacement of 2 missing upper front teeth with dental implants. Recreation of gum architecture, smile line, and lip posture with natural looking implant teeth is definitely a work of art.This patient had lost these teeth several years ago and there was substantial bone loss in the area. The goal of the surgery was to restore and augment the lost bone and place 2 dental implants to support 2 porcelain teeth that are individually connected to those dental implants. Replacement of such teeth in a esthetic zone (upper front) with dental implants, requires extensive knowledge, skill, and experience, to transform this smile into a pleasant, natural looking one. As viewed in the final x-ray, the porcelain teeth are supported by 2 strong dental implants that are inserted into the jaw bone. The Restorative phase: which is the placement of the final porcelain teeth. Color matching, gum adaptation, shape proportionality, and smile line recreation were some of the main challenges to overcome in this phase of dental implant treatment. The final photos show, these dental implant teeth look perfectly natural and this young patient is very happy to be able to smile without reservation. These dental implant teeth feel and function like natural teeth and can be brushed and flossed the same way as other natural teeth in her mouth. Dental implants offer the best solution for replacement of missing teeth. Here, 2 missing upper molars are beautifully replaced, using dental implants. Replacement of 4 missing upper front teeth with 2 dental implants. Dental implants are surgically placed in the upper front section of the mouth. Abutments are attached to dental implants to hold the final teeth in place. Permanent teeth are in place. This 4 tooth bridge is supported by 2 dental implants and stay in place permanently. They look, feel, and function like natural teeth. Beautiful and predictable results are possible when facing multiple and complicated dental problems. This individual has 3 missing teeth in the upper front area and 3 other teeth should be restored. A close-up of the smile shows a challenging dental condition. Patient is a 48 years old successful businessman whose smile is vital to his career and social life. Dental implants have already been placed to replac the missing teeth. During the course of the treatment, temporary teeth were placed so that his social activities are not disrupted. 6 upper front teeth are beautifully restored using dental implants and porcelain teeth. Experience, knowledge, and artistry has enabled Dr. Khazian to transform such a challenging dental problem into this beautiful smile. This patient can smile and chew with confidence. Another photo of the finished case shows the implant teeth are very well integrated into the patient’s smile. Eating with these teeth is just as comfortable as natural teeth. This individual does not have to suffer from an uncomfortable and bulky denture. Implant teeth require minimal care. Basic oral hygiene, consisting of brushing and flossing and regular check up by your dentist, is sufficient and maintains a predictable and long lasting result. This case demonstrates replacement of 3 missing upper right teeth. This patient was using a denture for many years and wanted a more natural and comfortable replacement. 2 implants were placed in preparation for a 3 unit fixed bridge. Due to close proximity to the sinus in the back section which required additional bone and sinus graft procedures, Dr. Khazian and patient decided not to place a 3rd implant in that area and just restore this case with 2 implants and a fixed bridge. This picture shows special holding screws (abutments) placed on implants. A 3 unit fixed bridge is cemented to abutments. These teeth are permanently cemented in place, and as shown here, look very natural. They feel like being part of the mouth and patient will forget them shortly after restoration. Eating with them is very comfortable and feels like natural teeth. Patient does not have to use a bulky and embarrassing denture any more. This case demonstrates replacement of 3 missing teeth in upper right area. These teeth were missing for many years and patient was wearing an upper partial denture which was bulky, uncomfortable and unnatural looking. She was seeking a better alternative. 3 implants were placed. Healing screws are in place to form a natural looking gum around final teeth. The openings through the gum show the location of implants. This is 3 months after implant placement. The gum has healed completely and implants are ready for final teeth (loading). Final teeth are placed in position. Note the gum architecture and esthetics are superb. These teeth are individually supported by each implant and are completely separate from each other and adjacent natural teeth. This condition will allow patient to floss them just as she flosses her natural teeth. Another photo of the finished treatment shows excellent integration of implant teeth into patient’s smile. Provided with regular care, these implant teeth will function comfortably for decades. Modern implant dentistry offers the best solution for missing teeth and/or denture problems. Dentures and bridges are obsolete and outdated. They definitely do not meet the current criteria in modern dentistry. If you have missing teeth (or about to lose any teeth), call 866-4my-smile to have a complimentary consultation with Dr. Khazian and learn what modern dentistry can do for you. This case involved replacement of 2 missing teeth on upper right side. The teeth were missing for over 3 years. 2 dental implant were placed to support 2 porcelain teeth. This picture shows abutments in place and attached to implants. Final porcelain crowns will be attached to these abutments. Final porcelain crowns are in place and patient is happy to have those teeth replaced. Final x-ray shows implants and crown are permanently in place. Since these 2 teeth are individually supported by each implants, and are not connected together, patient can floss them just as if they were his natural teeth. These 2 teeth are strongly in place and do not move under function. They look, feel, and function like natural teeth.